...starts tomorrow. This weekend is going to be amazing! I've been reading on it or something "watching" the live ticker. 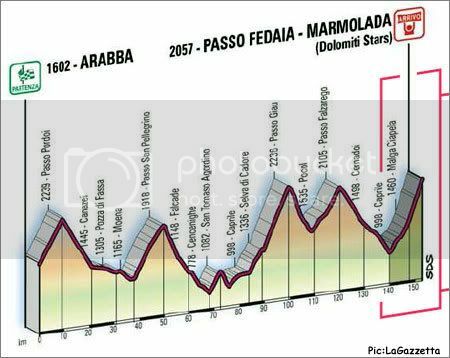 That Arraba-Marmolada stage would be something to watch, I spent a couple weeks in Cortina this winter and took the bus over several of those passes almost every day. Some of the most jaw-dropping scenery I've ever seen in proximity to a paved road. you can watch live coverage at cyclingfans.com. There are two streaming video feeds from different euro television networks, both paired with english eurosport audio stream (which unfortunately ends on sunday). I got up early this morning (6 am here in california) to watch today. Today's the day... let the race begin!! I'm in the US and we have next to none. We get two hours per week on a network called Versus. I timed Versus once and found out that 45% of their time is taken up by commercials. Another 10% is consumed by product placements. I was so infuriated by this that I promised myself to never buy a product advertised on Versus. 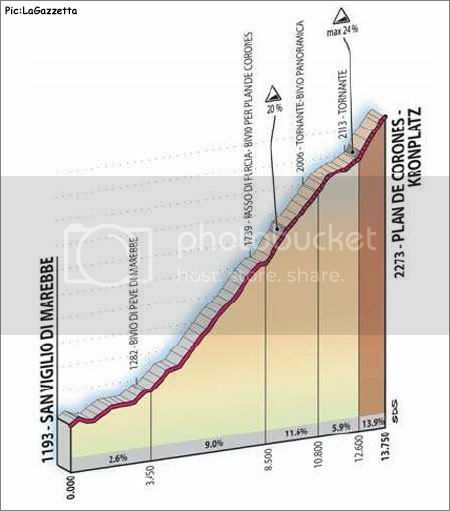 The Plan de Corones will probably be renamed Plan de Contador. I wouldn't want to follow him up the 20% gradients in a car. In the US and I beleive in Canada too, you can watch live online. http://cyclingfans.com/ several alteratives for doing that. I hope that helps. I'd hate to see anyone miss this stage!! I timed Versus once and found out that 45% of their time is taken up by commercials. Another 10% is consumed by product placements. I was so infuriated by this that I promised myself to never buy a product advertised on Versus. It's new to you that the US is driven by marketing and consumerism? Even the movies are chock full of product placement since there aren't many commericals. It's just part of living in the USofA. I appreciate the Versus coverage, and take it for what it is. That being said, if you watch any TV in the US, you need a DVR. These are the most underrated of inventions. We don't even watch that much TV, and I think it's a better invention than cell phones, email, and fat free ice cream. Is there anyhwere to get an english audio feed? I'm watching at cyclingfans, but I have no idea what is going on. Yeah, the Eurosport link isn't working. Great stage today. I think there are eight guys with a legitimate chance of winning this race. I can't remember the last time we saw that this late in a Grand Tour. I come here to keep abreast of these things. That was an epic ride by Sella. He does not need to HTFU. It was awesome how RAI started showing him in black and white at the end. There was a hell of a lot of suffering, but overall I was a little disappointed today. Not to many fireworks until the last 2K, then it just exploded. Contador and Kloden definitely showed their lack of endurance. the alpe is always a great stage...i didn't expect sella! 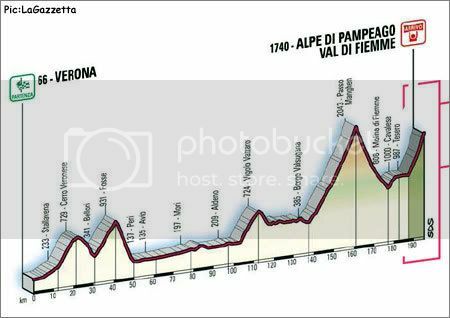 which climb is the cima coppi this year? Contador and Kloden definitely showed their lack of endurance. Contador has looked pretty good the last two days. There are still a handful of guys who could win this year. I think it's pretty exciting. Contador is showing his class. The last three stages have been beasts. His fractured elbow seems to be no big issue with Bobke and Co.?? C'mon thats enough of a ding to send more than a few riders onto the DNS list at this stage of the race. They did that on a previous stage also. I LUV RAI!